Over the years, growing rice has been transformed from a spiritual- based endeavor into a scientific-based activity. More often than not, today’s rice farmers do not pray to spirits to ensure a bountiful rice harvest. Instead, they use modern varieties, modern technologies, and ask researchers to help them with their problems. From agronomy to soil science to molecular genetics, rice scientists around Asia—and the world—are on the cutting-edge of research. And for good reason: the need to produce more rice is more urgent than ever before. Rice scientists in Asia and their partners around the world are tirelessly working to help farmers in developing countries in Asia grow more rice on limited land with less water, less labor, and less pesticides—and to do so without harming the environment. With the population of rice consumers increasing by 1.7 percent annually and the growth rate of rice production slowing to 1.2 percent, something needs to be done to avert disaster or Asia’s tomorrow will be bleak—even for the rich. 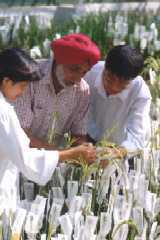 One of the world’s most famous rice scientists is World Food Prize laureate, Dr. Gurdev Khush. "Our ability to feed the billions of people who depend on rice is pivotal on the continuous supply of high-yielding and genetically diverse rice varieties," says the principal plant breeder at the International Rice Research Institute. If the world does not act quickly, what will Asia's tomorrow be like?